Exiling a Lord creature that is pumping another attacking creature during declare attackers phase. When the text says copy target instant or sorcery spell like in twincast or Sigil Tracer can i copy the spell that my opponent cast like lightning bolt, shock, or boomerang? 3) I haven't read the spoilers. I've just always kinda wondered why they had to be elite-only cards. So my mind started asking 'what if' and dreamed up a common cycle. 5) Lightning Bolt it's not showing. Look at the Alpha version. 9) Banding was too confusing for noobs. So was tapped creatures not dealing damage, artifacts switching off when tapped, and interrupts. Not to mention good-ol' "damage on the stack" Morphling . The game changes. You get used to it. The structure is a lot better now than it used to be I think. 10) it's more about the concept. One could have a goblin "when this dude comes into play, regrowth a burn spell" or something to that effect. Subtypes in general allow for more flexibility in card manipulation, that's all. If this weren't true they wouldn't have made Lord of Atlantis a me folk. 11) also, about the concept. From a design perspective, you don't want to make a card too powerful because everyone is going to run four of them. But if you add a self-restriction it mitigates the possibility it will warp the meta game. Also, it allows for cards that while not necessarily broken would be too complicated in multiples, such as Teferi's Undoing I'd posted the other day. That was supposed to have "Build:1" but I ran out of space. BTW you forgot Chain Lightning not instant but it used to go in 'that' deck. I started playing with Antiquities. I wasn't ready to spend $7 on a pack of Arabian Nights just to have the older cards I'd missed out on but I made sure to get in on Legends. The first rare I cracked in that set was The Tabernacle at Pendrell Vale . I got $20 for it. When gold cards came out, we were all wowed. And yes, I do remember. Senomar : Deeproot Champion added. VietMoneys : Food Chain , Lord of Atlantis , Rhystic Study , Vampiric Tutor all added. Maybe Muddle the Mixture to stave off a Wrath of God or to tutor Lord of Atlantis ? If there's some way I can help get these into the system let me know. I've tried using the add card function to no avail. I know you mentioned previous promotional printings being a pinch point, but I believe Vampiric Tutor is the only card that this might effect (and there is still room to use "Promo Set for Gatherer" instead, I believe. Thanks again for the support on this so far! I don't think Light Up the Stage is as bad as or can really be compared to Browbeat . It's only a one mana investment that always draws you two cards (note that it lets you play those cards until the end of your next turn), which either directly gives you more burn or gets lands out of the way so you can draw more burn, while Browbeat is 3 mana for basically the same thing. If I had to compare the two, I'd say Light Up the Stage is far superior simply because it's cheap, which allows you to play spells after you cast it. That said, I wouldn't play more than like 2 of it for the same reasons I assume you wouldn't (cuz it doesn't do dmg), and even then it would be a tentative inclusion. I'd have to test it myself to see whether it's good or not. I don't agree about Skewer the Critics . In the end, it's a Lightning Bolt , and Burn always wants as many of those as can possibly fit in the deck. You don't need to be bent on playing it on turn 3 after a 2 mana card, either. It's just as good as a turn 2 or 3 or 4 play after an L.Bolt/R.Bolt/F.Bolt/Spike, which if I may remind you occupy a greater proportion of the deck than Searing Blaze , Keldon Marauders , and Viashino Pyromancer . I'm not saying you should cut Vexing Devil in specific for it btw, I don't think the devil is a bad card. I do think Skewer is good enough to play over Rift Bolt though, and it's definitely better than Viashino Pyromancer . Alright, so a simple argument against your argument against Goblin Guide and Monastery Swiftspear is the fact that literally everybody plays them rather than Vexing Devil , Viashino Pyromancer , and Keldon Marauders . 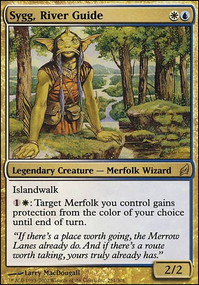 Like, if you were to look up mono red burn decks online, you'd see that most all of them have playsets of Swiftspear and Goblin Guide, which suggests that they are better cards than what you're playing atm. Heck, even competitive Legacy decks play all 4 Swiftspear and Goblin Guide (in fact, I have yet to see one that doesn't play them). Cards like Keldon Marauders / Viashino Pyromancer only really appear in budget burn decks from what I've seen. Goblin Guide and Monastery Swiftspear are 1 mana creatures, unlike Keldon Marauders and Viashino Pyromancer . Since their damage output is roughly equivalent when scaled up, this makes them better than both of those in my books. Both Guide and Swiftspear have haste, which means they are immediately useful no matter when you draw them. 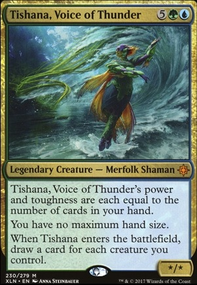 Guide and Swiftspear both have 2 toughness, which means most anything that your opponent can play on turn 1 won't be able to block them and kill them, unless they're playing above-curve creatures in terms of power (in which case you'd probably be playing the mirror match and they'd just attack you instead). They both essentially have 2 attack, which means most things that could block them early in the game will be killed, sometimes resulting in favorable 2-for-1's with Swiftspear. 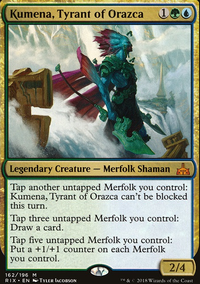 In addition, many decks that play creatures early on would rather keep them so they can carry out their own gameplan--for example, a Merfolk deck isn't going to trade off their Lord of Atlantis to kill your Goblin Guide , as their best shot at winning the match is by racing you. Monastery Swiftspear oftentimes goes unblocked because of the reason above and because of the threat of playing multiple spells at instant speed to create a favorable trade; that being so, it essentially says this: "Every burn spell you cast deals 1 additional damage." As you can imagine, that turns into a lot of extra damage. Add on to that the fact that it has haste, meaning it is immediately useful if drawn on turn 2-3 or later, makes it quite good. You're on the play and it's Turn 1. You play a Goblin Guide and attack for 2. Turn 2, you attack for 2 and cast two Lightning Bolt s. Your opponent is at 10 life and you have spent 3 mana and played 3 cards to get them there. You're on the play and it's Turn 1. You cast a Lightning Bolt and pass. Turn 2, you play a Keldon Marauders or Viashino Pyromancer . You've spent 3 mana and played 2 cards, dealing a total of 4-5 damage. So yeah. I'm not saying you should change your deck's creature base or anything, cuz it kinda defeats the point of posting a deck if it's just gonna be a copy of something online, but that's what I think. Btw, you said in your post that them being 1 cmc was a problem, and I don't really understand why. Lowering the curve is generally just better in every way when it comes to Burn imo; care to explain? In regards to Slagstorm , you don't really need to be blocking things in the first place. Your opponent should be dead or close to it by the time they get to casting 6 toughness things (which is turn 3 at the soonest for most ramp decks). Also, it does deal damage to the opponent, though it's a 'choose one' card so you can't do both at the same time. To be honest, though, I don't think you need any sweepers at all in your deck, besides maybe Anger of the Gods since Dredge and Arclight Phoenix decks are all over the place. It's not like there are any go-wide creature decks that are faster than burn in modern, and as you said, killing your own creatures is kinda bad. 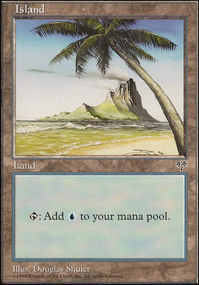 While we're on the topic, I noticed you needed some Tron/Scapeshift and graveyard hate in your sideboard. Molten Rain is great for Tron, and Tormod's Crypt and Relic of Progenitus are options for grave hate. Cards to deal with graveyards are especially important nowadays since gy decks have gotten a lot more popular recently, so I really suggest you play something for them. Sorry for the long post, I spent too much time on this. 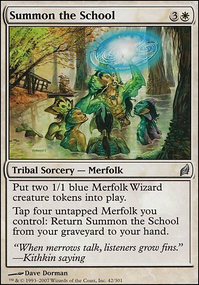 I played for a while with Silvergill Adept , but finally I changed it for Stonybrook Banneret for good. 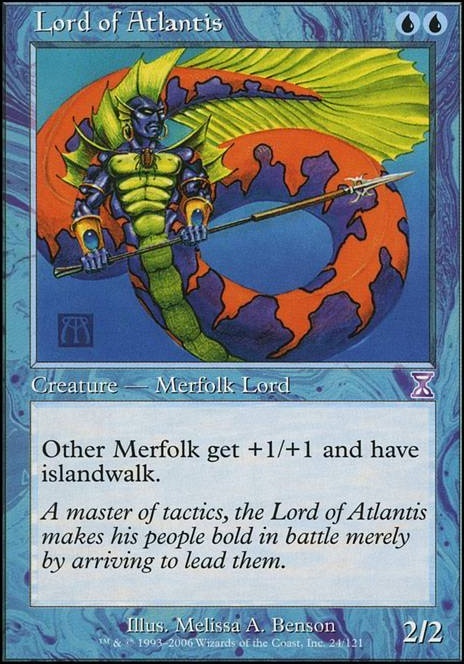 I didn't used Lord of Atlantis or Master of the Pearl Trident taking instead Merrow Reejerey because of the cost, but maybe I should include one of them (I'm already using 5 Lords, Merfolk Mistbinder and Merrow Reejerey , so I'm not really eager to include two others). And for sure, Aether Vial is out of my reach, at least, for now. Considering that the majority of the cards you are using are currently in standard at the moment I'd recommend looking at some of the things they are doing with them. Stuff like Silvergill Adept for example. 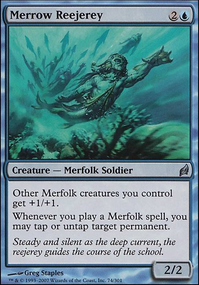 If you want to play merfolk in modern however there are a few cards that are pretty important and it's typically better to stay in mono blue from my understanding. Lord of Atlantis and Master of the Pearl Trident to name a few. Spreading Seas in combination with those two can be pretty nasty. Aether Vial is pretty nice as well but defiantly not budget, well at least not for me. 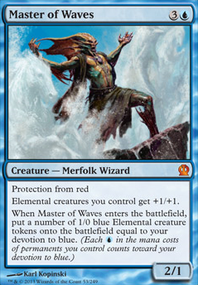 I just want to know if we i can use the spell to target him or his permanents when the ability or spell is in stack. Since it clearly states that you can choose a new target for the copy. Can i also use this ability if my opponent counters a spell that i cast.